A masked gunman turned and fired one or two shots at a robbery victim who chased after him in nearby Lincoln Park Friday evening, police and witnesses report. The bullets missed their mark. Officers were called to the area of Orchard and Drummond, about a block west of the Clark Street Best Buy store at 6:45PM after multiple 911 callers reported seeing a woman get mugged by an armed man wearing a ski mask. The victim, who had been robbed steps from her front door, decided to pursue the offender as he ran toward Clark Street with her purse. Seeing her in pursuit, the gunman turned and fired one or two shots at the woman, who took cover and was not hit. The gunman was last seen turning north on Clark Street at the Best Buy store. 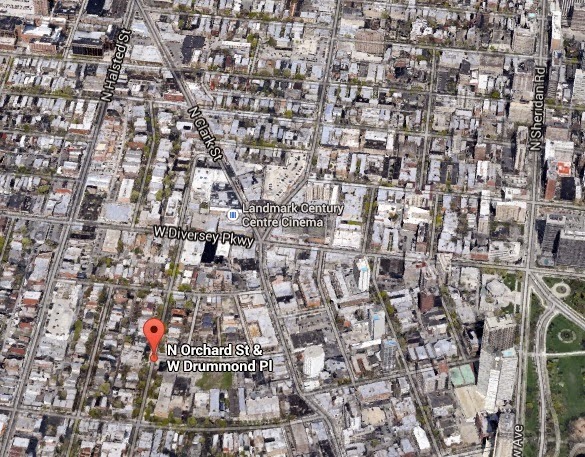 Police tracked the woman's iPhone to the area of Clark and Drummond, but soon lost its signal. The woman's bag was found about four hours later near the Covent Hotel SRO at Clark and Drummond. Varying descriptions of the offender were given. The victim described him as black, in his early 30's, 5'7" to 6-feet tall, wearing a black hoodie, and carrying a backpack. A witness who saw the robbery unfold from a nearby apartment described the offender as a Hispanic man wearing a gray Chicago Fire hoodie. The gunman remains at large. CPD case number HX426069.